I recently returned to a client’s home to do a little updating of some finishes and stenciling in their foyer. I did a scroll border (Palazzo Scroll Border by Royal Design Studio) above this doorway about six years ago. The homeowner decided that it was just too linear for her, so she was hiding it with this floral arrangement! The first thing I did (besides removing the floral arrangement) was to add some foils and leafing to the existing scroll design. Part of the foyer makeover also included putting a dark finish on the columns and woodwork. To break up the linear look, I added some horizontal elements, from another border, a Romanesque Frieze. And here’s a closer look. With the addition of some foils, metallic leaf and adding these new design elements in the center of the linear border, the design was given a new life. The height added to the center of the border, broke up the linear effect and gave the doorway a feeling of more importance. This new design will not be hiding behind a floral arrangement! 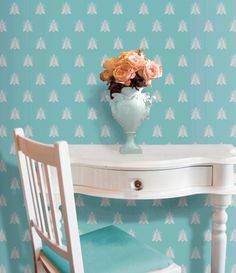 How can I buy this stencil? Ive been looking for a stencil like this for many months. Debbie, the two stencils Carol used on this job are from Royal Design Studio. Just use the links in the post and they will take you right to the pages where the stencils can be purchased. I’d like to buy it!! !